looks like a nice one great detail in the add. It's well worth the money, I'd say. I can't understand why the thermal reactor/smog equipment is still intact though. Not on the car...it has headers on it...it comes with all smog parts though. It is nice...and I LOVE the color. Alex, the owner , is a great guy. 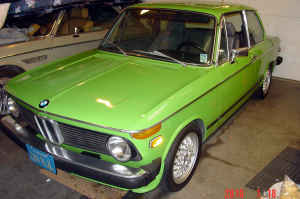 He has an e9 in Nevada, a rare color for a coupe, that needs restoration. This 02 is well sorted. im pretty sure iv seen this vehicle at coffee and cars in Irvine. its an eye catcher from what i remember.